January 14 2009, Sankranthi Celibrations. Prize distribution and Drama by Prashanthi Nilayam Campus. Sankranthi is a festival that signifies the beginning of the harvest season for farmers in the Indian Sub-Continent. This is a harvest festival celebrated not only all over India but in other South East Asian countries as well. The day on which the sun begins its journey northwards is referred to as Makara Sankranti. Sankramana means "to commence movement". Hence, the name Makara Sankranti is given to one of the largest, most auspicious, but varied festivals in the Indian subcontinent. As Swami says, the northward movement of the sun, towards the Himalayas where Lord Shiva resides, signifies the culmination of a period spent in intense thoughts of the Lord with the soul finding fulfillment in the Divine. Traditionally, this has been the story at Prashanti Nilayam with the students especially receiving the sweet fruit of their month-long efforts for the Sports and Cultural Meet, from their dearest Lord. 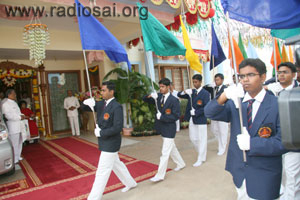 The morning saw Swami being welcomed into the Kulwant hall by the Institute Brass band followed by a regal regiment of flag bearers. 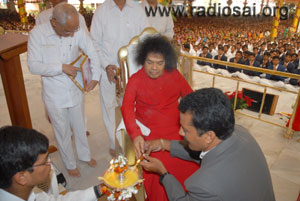 Swami came in the special golden chair. 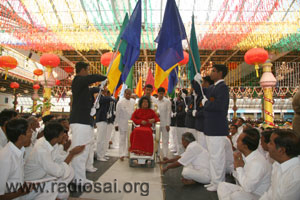 It is a wonderful opportunity and joyous occasion when Swami arrives in that chair for it is a foot higher than the usual one. 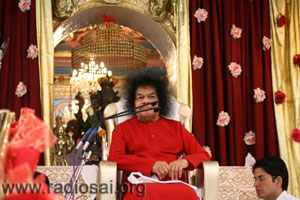 Swami took a complete round of the Sai Kulwant Hall. It was quite a sight to behold when the flag bearers formed a canopy of flags under which Swami passed, with a sweet smile on His face. Completing the rounds on the gents side, Swami moved up the stage. All the different trophies and prizes adorned the stage. Swami seemed to be having something to covey to all. Calling Professor Anil Kumar, Swami asked him to make an announcement. And then came the joyous news that Kumari Chaparala Sohini from the Sri Sathya Sai Higher Secondary School, Prashanthi Nilayam had achieved the 1st rank in the highly competitive all India CBSE (Central Board of Secondary Education) examination for the year 2008. She would be honoured in the Prime Minister's gallery on Republic Day. The student was called onstage and felicitated. 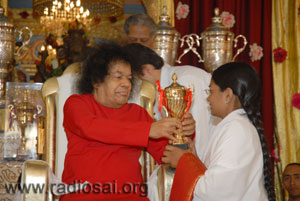 Swami presented her a silk saree and a trophy. She took padanamaskar and expressed her gratitude to Him. 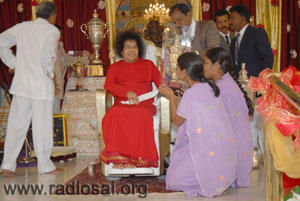 This was followed by Swami blessing all the medals and certificates before bestowing them upon the students. Swami enquired into the details of the medals won by the different campuses and had it announced. 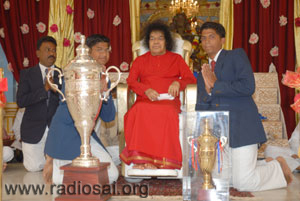 After that, Swami presented the cups to different campuses. 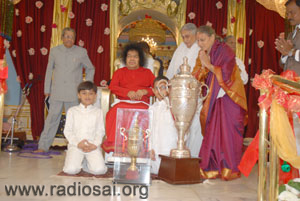 Swami kept stressing that all the prizes were being given by the 'government' to honour all the prize winners. The representatives from the Prashanthi Nilayam, Brindavan, Anantapur and Music college came up and received the cups from Swami. Bharat is the motherland of many noble souls who earned great name and fame in all the continents of the world. This is the land of valorous people who vanquished the foreign rulers in the battlefield and attained independence. This is the land that excelled in music, literature, and other fine arts. Having been born in this great land of Bharat, oh boys and girls! It is your sacred duty to protect its rich cultural heritage. Dear students! Be prepared to uphold the honour and glory of this country of Bharat! You are sure to come out victorious in this effort. Today, people are able to achieve great progress in secular and scientific fields, but they are unable to march forward in the field of spirituality. One has to progress in spirituality more than in other fields. People used to give great importance to progress in the spiritual arena in the ancient times. In fact, it used to be the goal of their life. However, there is a decline in the spiritual outlook of people in recent times. In these days a lot of effort is made to achieve progress in secular, physical, and worldly matters. Whatever achievements made in these areas are only temporary and transitory; they are not permanent. While people are able to make giant strides in secular areas all over the world, there is decline in the importance given to spiritual and moral progress. This tendency is in sharp contrast to the culture of Bharat in ancient times. This land of Bharat has given birth to many noble women like Savitri, who brought her dead husband back to life; Chandramati, who extinguished wild fire with the power of truth; Sita, who proved her chastity by coming out of blazing fire unscathed; and Damayanti, who reduced an evil-minded hunter to ashes with the power of her chastity. This land of piety and nobility attained plenty and prosperity and became the teacher of all the nations of the world because of such women of chastity. Savitri, a great woman of chastity, brought her deceased husband back to life by the power of her chastity. Such women brought great name and fame to the country of Bharat. Can you find parallels to her anywhere in this world? No doubt, whoever is born must die, but is there a woman in any country in the world who could bring her dead husband back to life, except in Bharat? The whole world is falling to abysmal depth due to transgression of the righteous path, lack of character, and bad behaviour. Once Arjuna was narrating to King Dharmaraja a few strange incidents he observed while going on a tour of the Kingdom. A farmer reported to Arjuna, "Swami! Yesterday I left the implements in the field itself after ploughing, since it was getting dark. Today when I went to the field to pick up those implements, they were not to be found there." On another occasion, he noticed some ladies locking their houses and going out. On enquiry they informed him, "Swami! We wanted to go out on some work, and unless we lock our houses, our belongings won't be safe." This was stunning news to Arjuna, since no house in the kingdom used to be locked in those days, unlike in present times, and people were able to move very freely without any worry. Later, when King Dharmaraja himself went on a stroll, he observed a lady talking to a man in public standing in the middle of the road. Such type of behaviour went against the custom prevailing in the country. Dharmaraja was taken aback at these developments and felt that the age of Kali had begun. He therefore decided that it was time that the Pandavas leave for their heavenly abode. Ladies and gents engaging themselves in conversation in full view of the public was a taboo in those days. Bharat is a land where noble thoughts and feelings are cultivated right from childhood. In fact, Bharat is the spiritual teacher for the entire world. Even now, you will find that Bharatiyas do not go astray in their behaviour, as it is happening in some other countries in the world. They are decent and courteous in their behaviour, at least in public. Even an aged son dare not talk to his mother standing in front of her. 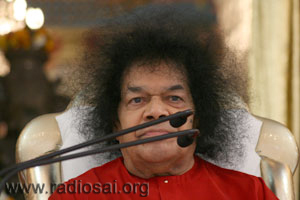 In the earlier days of Swami's Avatarhood, the Raja of Venkatagiri used to visit Puttaparthi. He used to bring the heir apparent and his other son along with him. Before their departure, the sons used to take the blessings of their mother, who used to sit behind a screen and stretch her legs for her sons to offer their obeisance to her. Such were their noble feelings and exemplary character. Today, you will find boys and girls moving together even in public places. If someone makes enquiries, they reply that so and so was their classmate. Such acts in the old days were considered as highly improper. In fact, the term "classmate" itself is a wrong expression. Do not use the word "classmate". Say, "a fellow student in the class". The rules of conduct in the earlier times were very strict. The situation has changed now. Boys and girls visit each other's houses without any inhibition and even dine together. This is highly improper. Before doing such things, one has to ask oneself, "Am I a human being or an animal or a beast?" Animals have animal qualities, but you are a human being. Hence, you should possess human qualities. You say you are a human being. Therefore you have to ask yourself, "Do I possess human qualities?" What are those human qualities? Never hurt anyone. Do not speak harsh words against any individual. Have compassion and a charitable disposition. Only such a person can be said to be a human being. Sathya (truth), Dharma (righteousness), Shanthi (peace), Prema (love), and Ahimsa (nonviolence) are the five qualities a human being should possess. Bidding good-bye to Sathya and Dharma, people pray for Shanthi. Is it possible? Can anyone get peace outside? Peace is a state of mind that is very much inside one's own self. It emanates from one's heart. People are now searching for peace in the outside world. There is reaction, reflection, and resound for everything in the world. Only when you develop the quality of hatred in yourself will you see hatred in others. Even when no one causes any harm to you, you try to hurt others. Whatever you do to others, surely you will experience the result of that action. Whatever you hear or experience is all due to the reaction, reflection, and resound of your own actions and feelings. Others are not responsible for it. You forget this simple truth and lament, "so and so is accusing me; so and so is causing pain to me; so and so is hurting me", etc. No one is responsible for either your good or your bad actions. Neither is it God's creation, for God is nirgunam, niranjanam, sanathana niketanam, nitya, shuddha, buddha, mukta, nirmala swarupinam (God is attributeless, unsullied, final abode, eternal, pure, enlightened, free, and embodiment of sacredness). You go on fighting with others and try to hurt them. Then you are not a human being at all! Always help others, never hurt anyone. "Help Ever, Hurt Never." It is said, Paropakara punyaya, papaya parapeedanam (one attains merit by serving others and commits sin by hurting them), Sarva jiva namaskaram Kesavam pratigachchhati (whomever you salute, it reaches God), and Sarva jiva tiraskaram Kesavam pratigachchhati (whomever you criticise, it reaches God). You think you are accusing someone or making fun of someone. It is all your illusion. In fact, you are accusing yourself and making fun of yourself in the process. Everything has reaction, reflection, and resound. You yourself are responsible for either good or bad. If you wish to enjoy good things in life, do good to others in the first instance. Today's education is information-oriented. It is bookish knowledge. It is not real education. It is not this type of education that you should pursue. You have to pursue "Educare". Educare manifests in one's own heart. Education relates to gathering information by reading several books and storing them in your brain. Whatever you remember out of that knowledge, you will reproduce in your examinations and acquire degrees; that you call education. That is not real education. You have to follow your inner voice. That is real education. In the recent sports day, you played many games, displayed beautiful gymnastic skills, and sang several songs. All these activities relate to the body, which is the result of your past karmas (actions). However, do not repose absolute confidence in the physical body. The body is given to you for discharging your duty as a human being. Do not misuse your body. It is the responsibility of teachers, headmistress, principals, vice chancellors, and chancellors to teach the students the value and purpose of human birth. Your duty is to follow your conscience. Your conscience helps you manifest noble qualities. But you do not pay heed to the voice of your conscience and go against the human values. Hence, never ignore your conscience. Your conscience is your most valuable property. You do not have to do japa (repetition of the name of God), tapas (penance, severe austerities), dhyana (meditation), or yoga. You will achieve a lot of progress in your sadhana (spiritual practices) if only you listen to your inner voice. Whatever comes from the depth of your heart will do good for you. Whatever goes against the dictates of your conscience is worldly, whereas inner voice or conscience is spiritual. "Help Ever; Hurt Never," is the cardinal principle of spirituality. Whoever follows the inner voice will always be safe. Never go against that inner voice. That is true spirituality. Spirituality does not mean just conforming to worship and meditation. These practices have degenerated into several undesirable activities these days. The underlying principle and the purpose of these sadhanas are totally forgotten. It is said, Manasyekam vachasyekam, karmanyekam mahatmanam (Those whose thoughts, words, and deeds are in perfect harmony are noble ones). Unless there is perfect accord between your thoughts, words, and deeds, you are not a human being at all! You get very angry against someone and slap them. But think for a moment; it is a great sin to hurt others. In the process, you are hurting not your enemy but God, verily! All are divine. Hence, never hurt anyone. It is natural to help those who help you, but you should be able to help even those who harm you. There is nothing great in helping those who have helped you. The noble ones are those who help even those who have harmed them. It is only Sai in this world who helps even those who try to harm Him, ignoring their faults. I never mind the harm done to Me by others. We must always be calm, serene, and peaceful under all circumstances. If only you maintain the quality of peace, you can achieve anything in life. Wherever you see in the outside world, it is only pieces and pieces! Do not hurt the feelings of others, come what may. Always treat your parents with love and respect. In fact, your parents are your first teachers. Respect them. Any amount of your good work that inconveniences your parents is of no avail. That cannot be considered good work at all. Though it may appear to be yielding some benefits temporarily, the end result of all this work will turn out to be very bad. Hence, ensure that you do not cause any inconvenience or suffering to your parents. The more you inconvenience them, the more you will suffer. With regard to charity, the more you give in charity to others, the more benefit you will receive later. Therefore, try to help others, always. Do any kind of seva (selfless service) that you are capable of. When you thus go on helping others, you will be progressing in the path of truth. As you travel in the path of truth, dharma will automatically follow. Where sathya (truth) and dharma (righteousness) go together, santhi (peace) will reign there. Then prema (love) will follow. Where there is love, there hatred cannot be. You will not have enemies then. It is only when the spring of love gets dried up in your heart that you will try to cause suffering to others. Hence, develop love for all. Sathya, dharma, santhi, prema, and ahimsa are human qualities. Today, there is rampant violence everywhere in the world. People are afraid to stay alone even in their houses. Several changes are taking place all over the world. Earlier, the United States of America was considered to be a super power and a wealthy country, but now, all that glory is gone. As a result, people who were going to their workplaces in cars earlier are now walking. We think money and wealth can do anything. But money is not important; your mind is important. If only you can control your mind, everything will turn out to be good for you. Whatever work you undertake, do it with a sense of dedication to God. Sarva karma Bhagavad preetyartham (do all actions to please God). Always remind yourself that God is the doer and you are just an instrument in the hands of God. You can achieve anything in life only when there is the Will of God. Perform your duty and remain a witness to all that goes in the world. It is said, "Paropakarah punyaya papaya parapeedanam". Always follow the principles of "be good, do good, and see good." Let your tongue speak only the truth. Let all your deeds be helpful to others. Whoever undertakes service in society with such a motto will always be happy. Pride, jealousy, etc, are all bad qualities. They drive away good qualities. They do harm to you as well as to society. Hence, be good and do good to others. If someone is in a difficult situation, go all out to help them even at the cost of your own work. This is the foremost duty of a human being. "Help Ever, Hurt Never" should be your motto. It is enough if you remember these two commands always. Do not cause harm even to your enemy. Hurt never. Do not cause even the slightest inconvenience to others. This is true education. You make your parents suffer in the house, come to the office and show your egoistic power on your subordinates, and draw a huge salary for your so-called work and responsibility. This is a great mistake. As you go up in your career and life, your ego and jealousy must come down. Then only will you earn respect from one and all. Always remember society and its welfare. You are a member of the society and therefore you have a social responsibility. You owe your very existence to society. Similarly, society is not separate from you. Individuals make a society. You and society are inseparable and mutually dependent. Only when fellow members of the society prosper will you also prosper. You all have done well in your studies, getting good marks and securing ranks. You brought good name to the Institution in the fields of education, sports, and cultural activities. Yesterday, you witnessed a play on Bhakta Potana. He did not feel bad, in spite of criticism and belittling from his brother-in-law Srinatha, also a great poet. Since Potana was a great devotee of Rama and surrendered himself totally to the Lord, Rama Himself composed the great epic Bhagavatam on his behalf. Potana always believed that his poetry, his life, and even his very existence were all the gift of Lord Rama. He was a true devotee. When Potana was suffering from acute poverty and finding it very difficult to make both ends meet, his brother-in-law advised him to dedicate his works to the King and make a comfortable living with the money and jewellery gifted by the King. Potana refused to do so, saying that he would take refuge only in Lord Rama. Instead, he decided to live by cultivating his small piece of land. One day, while Srinatha was going by the side of the fields in a palanquin, he saw his brother-in-law Potana working in his field. He derisively passed a comment on Potana, addressing him as "haalika! ", meaning, "Oh farmer! Are you Ok?" Potana gave an apt reply saying, "how does it matter if I am a farmer? I feel it is better and nobler to make a living by farming than dedicating my poetry to earthly kings and living upon their charity. This gives me great satisfaction!" The earth is the basis for all objects and activities in the world. Whoever reposes his faith in the land will never undergo any difficulties. Hence, I advise students to develop faith in their motherland and pursue their vocations in this great land of Bharat itself, instead of dreaming to go to other countries like America and earn lakhs and lakhs of rupees. Earn name and fame in your motherland itself. Earning money is not something great. Even a beggar can earn a lot of money. "Money comes and goes, but morality comes and grows." Cultivate that morality. Whoever has morality will never undergo any difficulty. 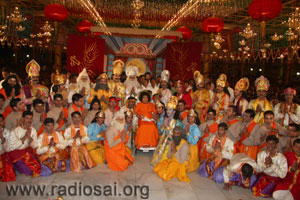 Swami sang Hari Bhajana Bina in conclusion. After that there were a couple of bhajans by the boys. Following that, the Institute Brass band struck up lively tunes and Swami sat listening to them. 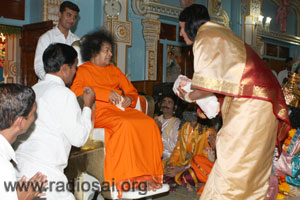 It was 11:30 a.m. when Swami received aarthi and retired for the morning. Before that, it was announced that in the evening there would be a drama by the students of the Puttaparthi campus of the University. A drama entitled 'Sri Krishna Tatwa Darsanam' had been planned and once again the Sai Kulwant hall was a hub of great activity as make up and settings started from 1:00 pm itself. 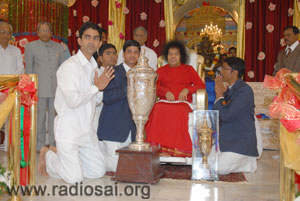 Swami arrived for darshan at 5:15 p.m. and completing His darshan round, Swami went into the bhajan hall where the entire cast had assembled. He enquired into the characters assembled there. He was very interested in "Draupadi". She carried with her a doll that was to 'act' as the baby Pareekshith. Swami seemed to gently tap the 'baby' on its head and everyone smiled in amusement. Duryodhana, Shakuni, Krishna, Bheeshma, the Pandavas and Durvasa were all 'introduced' to Swami. Last but not the least, the dancers too had their share of the Avatar's time! 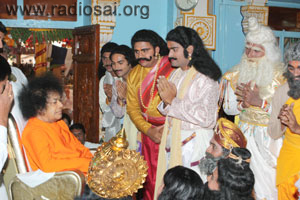 Swami blessed them all and they all wended their way out to the backstage to wait for Him to come out to the stage area. 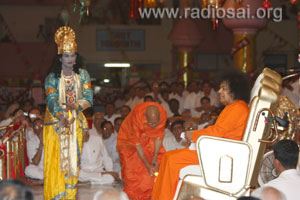 Soon after, Swami arrived and the initial offerings were made to Him. 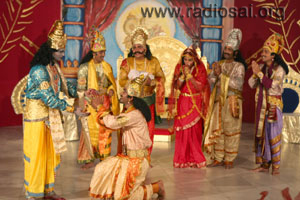 Swami converses with the actor of "Draupadi"
The drama began with the wise Vidura seeking peace and joy. For that, he wishes to attain the Brahmajnana. 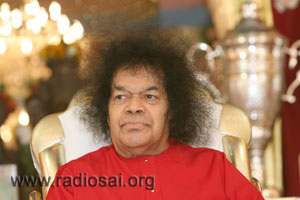 At that time, he is advised that there is no greater Brahmajnana than listening to the glories of the Lord. And so, if yesterday was the story of the composition of a Bhagavatham, today's drama lived through it. 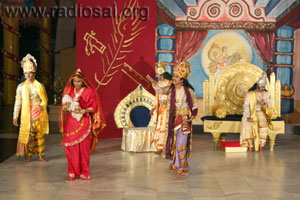 A graceful dance ensued narrating the glories of the Lord Krishna. Three main events from the pages of Mahabharatam were depicted. The first one was about the predicament the Pandavas face when the easily angered sage Durvasa visits them for food with all his disciples and there is absolutely no food to offer. 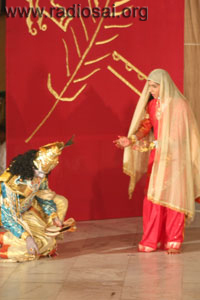 Lord Krishna accepts a leaf from Draupadi and is satiated. That fills up all the visitors and the Pandavas are saved from their wrath. What’s more is that the sage apologises for not fulfilling his obligations and blesses them. It went on to show how when one is able to please the Lord, the whole world is satiated. The other episode was how Krishna elicits a counter promise from the grandsire Bheesma who has vowed to annihilate all the Pandavas in battle. He sends Draupadi to him seeking the blessing of "Dheerga Sumangali Bhava" -May you have a rich and fulfilled married life! Thus, he is forced not to harm any of her husbands! To ensure that the knocking of Draupadi's sandals do not give her away in the enemy camp, Lord Krishna carries them for her in His shawl! 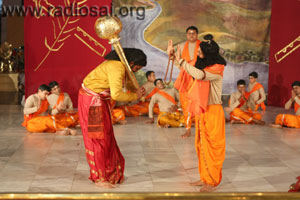 This brought tears to Bheeshma (and everyone in the audience too) seeing the extent the Lord goes to help His devotee. 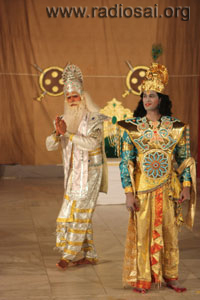 The final episode is when the Pandavas' grandson and Abhimanyu's son, Pareekshith, is born a stillborn. When there is sorrow and wailing everywhere, Krishna resurrects him with a mere touch. Arjuna, in all gratitude, calls Him a "Vamsharakshaka"( protector of one's clan). Krishna then reminds him as to how the very same Arjuna had called Him a "Vamshanashaka" (destroyer of one's clan) when Abhimanyu had fallen on the battle field. The Lord is not affected by our praise or blame. He is ever the same and unaffected. These episodes were portrayed with excellent acting and very powerful dialogues. 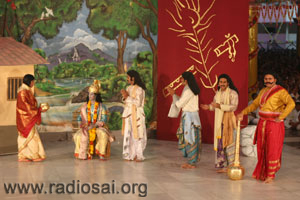 At the end of the drama, the final formation was made and the song proclaimed joyously that the very same Lord Krishna has arrived as dear Swami. 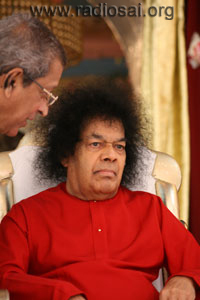 Swami was very moved with the song and as it concluded, Swami moved down for a photo session with the students. 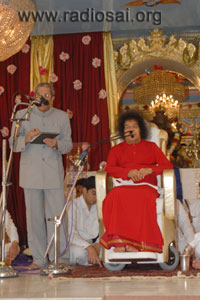 The session continued as Swami moved back up on the stage. And everyone who had participated in the drama in any way got a picture with Swami. Many letters were accepted and many words exchanged between the Lord and His students. 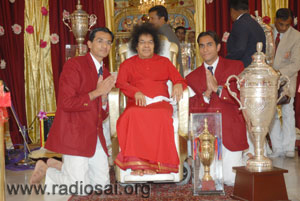 Swami said, "Today the boys have shown what Swami truly is!" 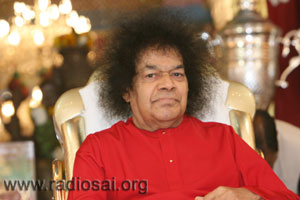 Swami then received aarthi and returned to Yajur Mandir at 7:10pm.